Lexus means luxury – but even luxurious vehicles can suffer dents and dings. EZ Dent solves this with a professional Paintless Dent Repair (PDR) service. Why Should I Use PDR Instead Of Going To A Body Shop? You need a full-service repair shop if your Lexus is seriously damaged, but they’re not necessary if you’re only trying to fix a few dents. PDR is a faster technique that allows us to remove a dented panel, then gently work the metal back into place from behind. Unlike certain chemical-based repair processes, PDR doesn’t risk damaging your original paint job, so the final fix will be as close to new as possible. This is the same technique that dealerships often use for their vehicles. They don’t like mentioning that luxury cars occasionally get dented before they’re sold – but since PDR is so effective at fixing the dents, most people never even realize they happened. How Fast Can You Fix My Lexus? Most repair jobs are finished in one hour or less. We have a convenient shop that allows us to get repairs in an out quickly. Vehicles with severe dents (either multiple large ones or numerous small ones) may take longer to fix. Our technicians can give you a more accurate estimate once they see the damage done to your vehicle. *Disclaimer – EZ Dent is not affiliated with Lexus or authorized Lexus dealerships. 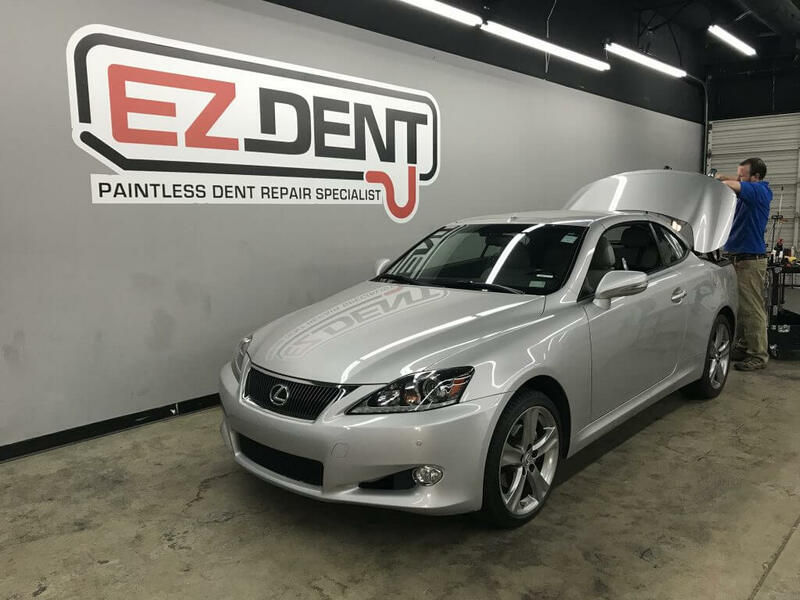 For more information about how our repair process works, or to schedule an appointment and get your Lexus looking like new again, contact EZ Dent today.